McCurdy & Rhodes provides design and consulting services to individuals, educational institutions, and builders of sail and power yachts. With over 100 commissioned designs and more than 300 custom and production yachts between 22’ and 95’ built we continue to actively provide design and consulting services worldwide. We have designed some of most popular designs built by the Henry R. Hinckley Inc, Heritage Yachts, Seafarer Yachts, and Intrepid Yachts. Our boats have consistently enjoyed more than their fair share of success in the world's major ocean races under multiple rating rules. 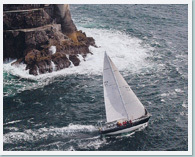 Our primary focus is the design and modification of offshore sailing yachts under 100' in overall length. Commissioned custom yachts have been built by Concordia Custom Yachts, Palmer Johnson, Paasch Marine Services, Henry R. Hinckley Inc., Frans Maas, Tillitson-Pearson, and Paul E. Luke, Inc.
From the keel to the mast head, we will guide you through every step of your boat’s repair, restoration, or refit. Our designs have been winning some of the most prestigious races since 1969, and cruising the world since the beginning. "One of the best sailed boats of this era."